After way too long, I finally had a weekend away, all to myself. Boys were happy to care for Neil, so I could have a break. 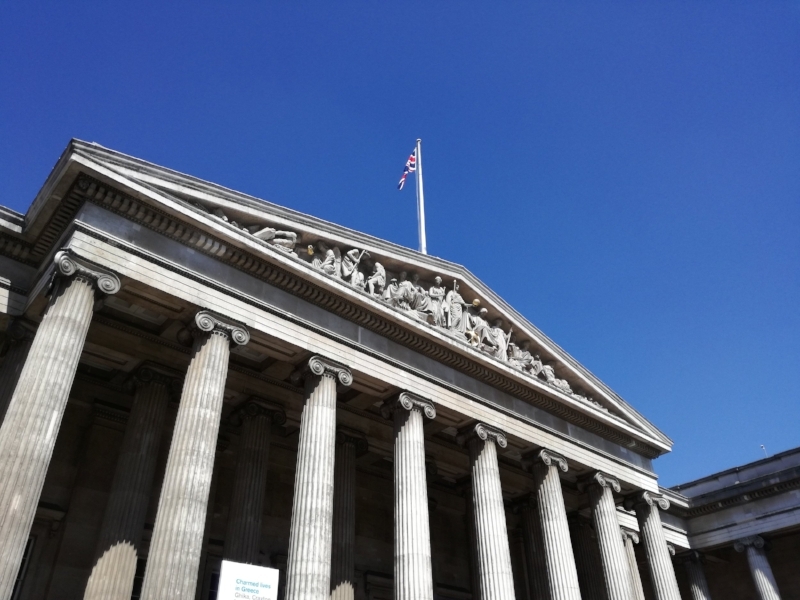 I decided to keep things straightforward and picked London and the British Museum. What helped the decision was a talk being held at the museum – ‘Ancient Myth in the Modern World’. The discussion was led by Bettany Hughes with Madeline Miller and Kamila Shamsie. I’d just read ‘Circe’ by Madeline Miller and was excited to hear her talking about it. I’ll review the book next week. This was the first time I’d attended a talk at the museum. All three women wore their knowledge lightly, making for a heartily entertaining discussion. At no point did any of them talk down to us; the assumption was we were as aware of the classics as they were. Obviously, I’ve been to the museum enough times before, but this was the first time I was there on my own. It was bliss, wandering around with no agenda. I’d already decided I would spend Saturday in Egypt and Greece after making my way around the Waddesdon Bequest, which I’d not seen yet. The Waddesdon Bequest is a collection of about 300 objects, left to the museum by Baron Ferdinand Rothschild in 1898. It’s meant to document the history of collecting. These are book covers! Rare survivors of the Reformation, ‘they decorated the Book of Epistles and the Gospels on the altar of the Gothic Minster in Ulm’. This is the Holy Thorn Reliquary. In 1239 in Constantinople, King Louis IX of France acquired the Crown of Thorns worn by Jesus; it cost him about half the annual expenditure of France! 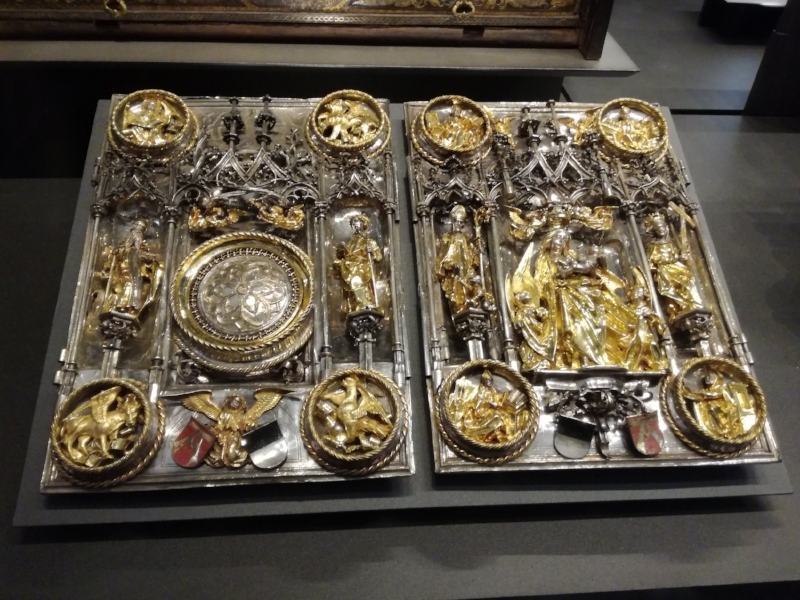 Then, sometime in the 14th century, Jean, duc de Berry, commissioned this reliquary to house one of the thorns. The thorn is in the middle, mounted on the sapphire, in front of the figure of Jesus. A hunting calendar (1600-1620), Germany, engraved with the names and figures of different game animals and hunting dogs. This depicts subjects from the ‘Aeneid’ (about 1540-50); Neptune calms the winds. 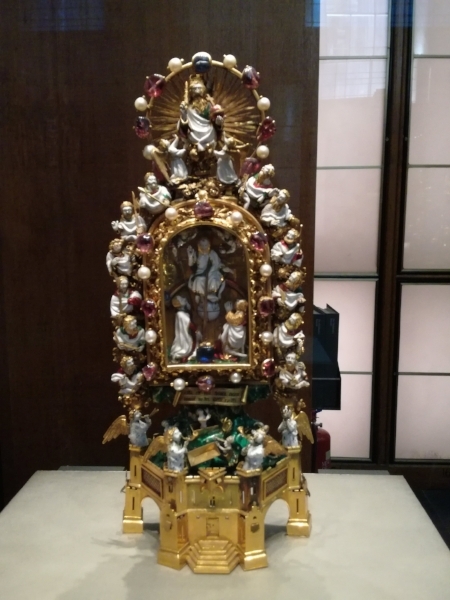 Miniature altar piece, dated 1511, carved with scenes from the life and Passion of Christ. ‘The Mausoleum at Halikarnassos was one of the Seven Wonders of the Ancient World. The modern word for a monumental tomb derives from the Latin form of Maussollos’ name’. Maussollos was a member of the Hekatomnid dynasty who governed Karia in south-west Asia Minor. He came to power in 377BC, by which time Karia was a distant part of the already weakening Persian empire. Maussollos succeeded in creating a virtual kingdom and established a new capital at Halikarnassos. 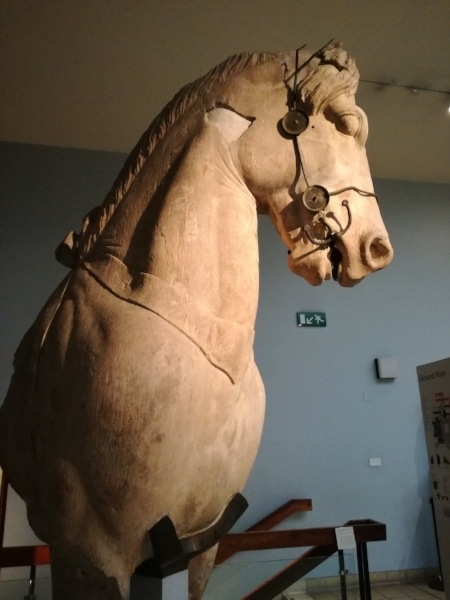 This is a forepart of a colossal chariot horse from the quadriga, a four-horse chariot group; it was positioned on the summit of the mausoleum. The original bronze bridle and bit remain on the horse. On Sunday, I spent time in Medieval Europe and India. I saved India for last because of the extensive refurbishment that had taken place last year; I was excited to see how different it was to what I remembered. This two-handed sword of state (about 1473-83) was used by the Prince of Wales at royal ceremonies. ‘The steel blade was commissioned in Germany and bears the mark of two running wolves. Along the edge of the handle are invocations to the Virgin Mary’. 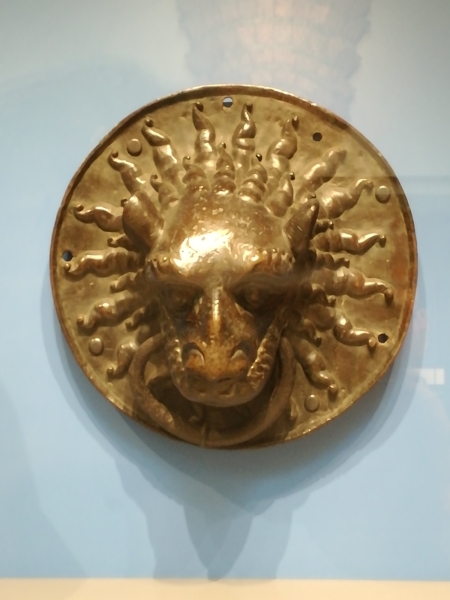 A lion-shaped door knocker (about 1200), part of the fittings of a church. ‘By grasping it, a wrong-doer sought the protection of the Church and accepted whatever punishment was imposed’. The Dunstable Swan Jewel (about 1400) was found in a Dominican priory in Dunstable. ‘It may have been worn to indicate an allegiance to the de Bohun family or to the House of Lancaster. King Henry IV took the symbol of the swan when he married Mary de Bohun in 1380’. Tristram and Isolde casket (about 1180-1200), one of the earliest representations of the medieval story. Three counters known as ‘tablemen’ (about 1180-1200), used in a game similar to backgammon. The Savernake Horn, a hunting-horn from Savernake Forest in Wiltshire, carved from an elephant tusk and decorated with enamelled silver panels. 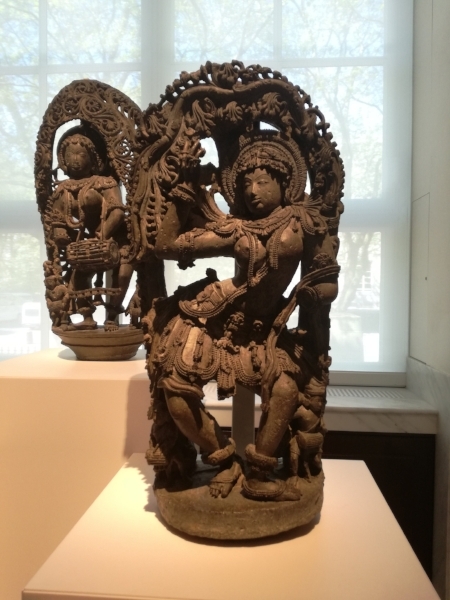 This stunning sculpture by the Bengali sculptor, Mrinalini Mukherjee, ‘suggests a female form… it has been built up using lengths of thin, folded clay lending it an organic quality, and is partly glazed’. The temples of the Hoysala Dynasty, which ruled the southwestern Deccan between 1006 and 1346, are quite distinctive and featured voluptuous female bracket figures that were placed at an angle between the temple wall and roof. The stone panel of elephant and riders is another distinctive example. This carved ammonite fossil is known as a ‘Shalagram’; it’s believed to be a naturally occurring form of Vishnu, representing his discus weapon, the ‘chakra’. These ‘fossilised marine molluscs are found in the Kali Gandaki River in western Nepal.’ This particular example has been carved on one side with an image of Vishnu lying on the cosmic serpent, Ananta. ‘Shiva dakshinamurti’ – ‘the god sits at ease in a position known as facing south. High in the Himalayas, where he resides on Mount Kailash, he turns to his devotees (the south is towards India) and teaches’. I love the serene expression on his face; it’s as if he really is looking down and smiling at you. Next visit, I’ll take in the rest of the gallery – the Amaravati Shrine and China at the other end.